this will be my league starter for 3.6... obviously I will change a few things when the patchnotes are released but this is what I have so far. I will make a full build guide out of this while I progress in the league. This build will be a cheap and strong league starter. I start with flame totems and als try out all the new holy skills. [3.6] Holy Flame Chieftain Build: A beginner friendly Path of Exile leveling guide! > Path of Building got updated. > Updated the leveling template according to new PoB data and leveling expierence. > Because of the feedback I changed the ascendancy order! - Clearspeed is not meta. The build concept is pretty easy..the Flame Totem and all new Holy Spells deal physical damage and convert a part of it to fire or fire / lightning. We use chieftain to get 100% conversion to elemental damage. Chieftain makes this build also very tanky and has great damage synergies with those skills. The use of totems make this build a cheap league starter. We get up to four totems (+1 Ancestral Bond, +2 Mutiple Totem Support). > Circle of Anguish rings: with inceased Herald of Ash buff effect are insane for more dps. Alternativly you can use one of the holy spells (Divine Ire, Wave of Convinction, Puryfing Flame) with a spell totem. I personally really like the offscreen clearing Kame-Hame-Ha totems best so far... very strong clear speed and single target dps. When you start leveling you can use for example Molten Strike / Smite and with level 4 you get the Flame Totem. On the skill tree we rush to "Ancestral Bond" to get a second Totem. From the Point we spec into Ancestral Bond we cannot do any damage any more. Try to get the skill combinations shown on overview picture as soon as possible. In Act to rush directly to the chamber of sins to get Herald of Purity & Ash. If you have mana problem you can use Clarity also. While leveling it makes sense to go for Elemental Overload and when you invest heavy into crit you spec out of it. While leveling I would not spend to much time with picking up stuff. Use rare / unique items you find to upgrade your gear and very important also upgrade your flask once in while. When you find a new weapon and don't know if it is better then your current one - just make a quick check how you ingame dps change... (while leveling that should be more than enough). Act 5: The Chambers of Innocence are a good place to farm some levels and gear before you encounter Innocence! Many player's recommend to use Nycta's Lantern at level 41 for the Holy Flame Totems setup as a leveling unique. When you finish the storyline with killing Kitava in act 10 I would recommend to spend your currency mainly on rare gear to cap your resistances at 75% and push your life pool as high as possible. 1) Ngamahu, Flame's Advance: 50% physical to fire, 10% fire penetration and dps. 2) Hinekora, Death's Fury: 1% damage leeched as life, totems leech 1% life for us, 10% more strength and a chance to cover enemies in Ash. 3) Arohongui, Moon's Presence: Enemies receive more damage near totems and deal less damage. 4) Tukohama, War's Herald: Totems are immune to fire, get 50% of our armour, can taunt on hit and reflect a part of the damage back to enemies. Bandits: Kill them all for two extra passive points. How do you solve the mana problem? First I am not sure if there is a mana problem. I think if mana is a problem I would drop Hatred and get Herald of Ash and Clarity instead. This will make our unreserved mana pool much higher and clarity would increase our mana regneration a lot. Next update from my side. Shortly after doing Shaper I spawned Elder Influence on T14/15 maps. Had originally planned to get level 94 or even 95 before going for Uber Elder but decided to give it a go. Did the T16 Elder Guardians with no problems yesterday. And today I killed Uber Elder. Had 3 deaths, which was about what I expected at the stage I am in. 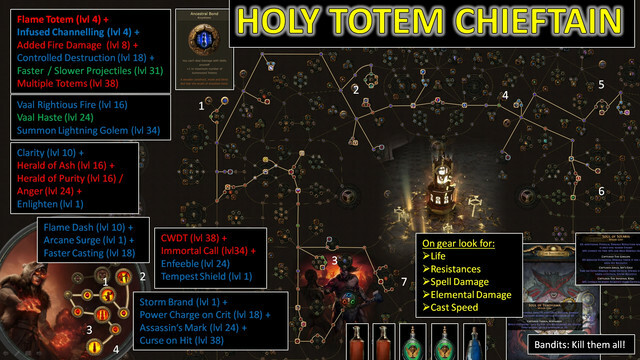 But it proves what I said: If built right, Holy Flame Totems are absolutely insane. I am nowhere near geared out. With a level 21 gem, a good +1 gems and spell crit Shaper chest, better Amulet, better wands and a -9% fire res helmet I would almost double my Shaper DPS to 4 million. - Essence of Hysteria crafted Opal rings are BiS imo. It is possible to use Mark of the Shaper + Essence crafted Elder Opal ring. But that is little damage gain for huge investment. And you lose the stats a rare ring would give. - get the 120% crit or the 10% penetration enchant on your boots, both are insane damage boosts for only a small time investment. - Anger Watcher's Eye "x% phys as extra fire damage"
- Links if above mentioned three proj. speed sources are met: HFT - Multiple Totems - Elemental Focus - Infused Channeling - Controlled Destruction - Fire Penetatrion. If not, sub in Faster Projectiles for Controlled Destruction. - I highly advice everybody to get Tukohama instead of Ramako if the goal is to do endgame content. I can say with 100% certainty that I could not have killed Uber Elder without the taunt. - get Arcane Surge in some way. I use my curse setup to proc a level 10 Arcane Surge. People forget how much damage it gives... While Arcane Surge is up I gain 18% higher total DPS, more than both rings cobined. And the mana regen is great too. - Solutions to the mana problem the build has: mana regen on the tree, rings and amulet. Flat mana where possible. Enlighten 3 linked to HoA, Anger and Clarity. Get Righteous Decree in the Templar area. All this is just my take on things. Do your own thing if you want, but everything I mentioned above is "Best Practice" in my opinion. Had planned to stick with the build for a while longer, but having done everything in the game I am not so sure anymore. It is a lot of fun, so maybe I will keep going to level 95 or something. Thanks to OP for the initial build! I'll still be checking in to answer any questions, but I wanted to leave my final PoB here. That should answer pretty much every question that could come up. I don't claim that this is anywhere close to the ceiling. My gear was just the best I could accumulate in the first 6 days of the league. The tree is highly built around my specific gear. But this will give anybody that wants to start the build or is already running it a good reference point. Now that read that insane number, I think I might have actually been the highest DPS character. At least I find nothing over 2.5m Shaper DPS on poe.ninja. Interesting to see what Holy spells and extra totem(s) bring to the table. This is basically what I'm planning as my starter too. It will be interesting to see the actual skill gem and the passive changes for Holy skills next to the Templar area they have mentioned. If Flame Totem has low added damage effectiveness, is added fire damage support worth it? Pretty sure this build will be able to do the whole content with a bit investment. Obviously I have to test a bit and optimize the build but I think this gonna be really strong. Yeah we will have to wait for the skill gems and the passive nodes in templar area maybe they are worth picking. I guess that added fire damage will be worth picking but I guess we have to see... I might change quiet a bit when all data is available. For now I planned the build using simulating a Flame totem with a Spell Totem linked with Glacial Cascade and a Pyre ring to convert most of the damage to fire. So I am pretty sure I will have to adapt quiet a bit :) without knowing the details it is hard to plan. Yeah, it's hard to plan without seeing the new tree and skill gem. So looking forward to this now and will jump straight on PoB when we get more details. I've bookmarked this thread and will be following closely. The other two old guides I could find for Flame Totem use Infernal Mantle as the Chest armour. I wonder if the new Flame Totem will keep the fire tag or it will be called Holy? Hello! Im a bit new, how can I see the skilltree better? I am pretty sure it will keep thw fire tag... but I guess have to see. @Jack: On WednesdaY the new skill tree‘s will be released then I will update the guide and post link to the skill tree. I will be using this guide come Friday, thank you for the efforts. This is obviously a level 100 build and completely unlikely in most scenarios but I will likely be dropping off health or the channeling/projectile speed nodes in order to get it more in line with a level 85 build. With the Holy Flame Totem getting the physical component of the spell, being considered "Channeling", getting 2 more projectiles at all levels it should be a fairly big buff to the skill. I plan on trying to use EB and getting a shaper shield with the +1 totem mod to it instead of using Tukohama's Fortress. This should allow us to use Anger as well as the new aura Zealotry if we end up needing it while still giving us enough mana to cast our totems.